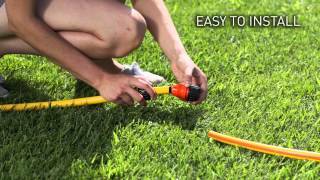 The most versatile tool-free solution to repair a hose or create an irrigation line of any length. Ensures a stable, leak-free connection. Its ergonomic design makes it easy and convenient to use even with wet fingers. For repairing a damaged garden hose or for connecting two coils of hose, even with different diameters. For hoses with 1/2” - 5/8” - 3/4” diameter.